Being Secretary of the Treasury does have its perks. On August 21, Secretary of the Treasury Steven T. Mnuchin traveled to Louisville, Kentucky to speak at a luncheon sponsored by the Louisville chamber of commerce. Joining him on the flight was his wife, actress Louise Linton. Later in the day, Mnuchin, Senate Majority Leader Mitch McConnell (R-KY), Rep. Brett Guthrie (R-KY), and Kentucky Governor Matt Bevin (R) visited the United States Bullion Depository at Fort Knox, Kentucky becoming the first civilians to visit the facility since 1974. The U.S. Mint posted a picture of Mnuchin holding a gold bar in front of a balance scale. On August 21, 2017, was the total eclipse of the sun that stretched from Oregon to South Carolina. Although the path of the total eclipse passed over part of Kentucky, the Fort Knox area experienced only 96-percent of the eclipse. 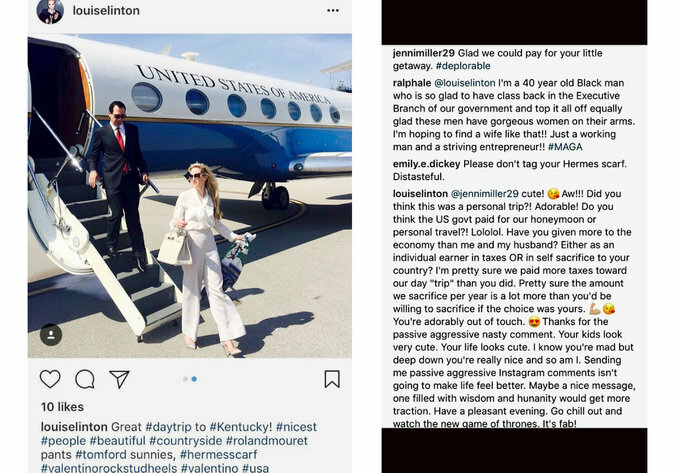 During the trip, Linton posted a picture of her departing a government plane on Instagram noting her attire. In the context of a diva actress, this type of braggadocio is expected. But as someone flying at government expense during what is supposed to be a government-sponsored trip. When a concerned citizen questioned her choices in the context of a government trip, Linton responded in a way that one would expect of a diva, self-centered actress. But as someone traveling using government-sponsored transportation, Linton’s comments were not well received. A day later Linton apologized for her comments, removed the Instagram post, and made her profile private. Days following the trip, Citizens for Responsibility and Ethics in Washington (CREW) filed a Freedom of Information Act (FOIA) request with the Department of the Treasury asking for information about the trip. CREW is questioning the use of government resources for what they claim is a personal trip. Sen. Ron Wyden (D-OR), the Ranking Member of the Senate Finance Committee, also wrote to the Treasury Department asking for records of justification for Mnuchin’s use of a government plan for the trip. Cabinet officials can request to use government flights under specific criteria. These flights are flown mainly using Air Force resources and are costlier than a commercial flight. It is recommended that cabinet officials use military resources only in the case of national security or for employees whose security could not be guaranteed in the commercial environment. A source has suggested that Mnuchin may have violated government policy by using the government plane for this trip. Mnuchin does not face a threat that requires additional security that would justify his using government resources. Further, since Linton is not a government employee, her travel is not reimbursable by the government. It was predicted that Mnuchin will be required to pay the difference between a commercial flight and the cost of the government flight. He will also be required to reimburse the government the full cost of Linton’s portion of the trip.